A reminder that I have a super duper awesome newsletter that goes out once a month and always has something special for subscribers, including free short stories, deleted scenes, and early behind-the-scenes info. You can subscribe at this link. p.s. Shards of Hope is almost out! 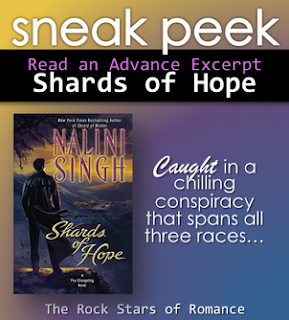 The final excerpt of Shards of Hope is now up on the USA Today HEA Blog! I hope you enjoy! The audiobook of Rock Hard is now out worldwide. Happy listening! I hope you're all having a great week. I've just sent the draft of Rock Kiss #3 (Noah's book) to my first reader, so today, I'm catching up on all the admin stuff I put aside while finishing the book. I also want to work on my "spare time" Psy-Changeling novella collection. 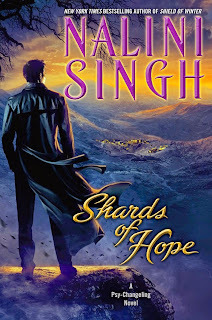 As promised, a new excerpt of Shards of Hope has just gone up at The Rock Stars of Romance! First up, I have a post up on Heroes and Heartbreakers today, talking about different kinds of series. Swing by and have a read! Lucas from Slave to Sensation took ten minutes to answer a few questions sent in by readers, and the interview is now up at Natasha is a Book Junkie, along with a great contest. Qs 1-3 are spoiler free, Qs 4-10 are spoilerific for later books in the series. Enjoy!! Exciting news! For the first time ever, Slave to Sensation is on sale in the USA/Ca, for 24 hours only. It's currently $1.99 on Nook!! News! 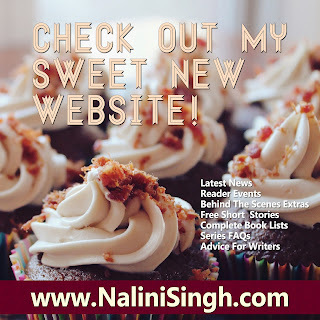 My website has received a makeover! Swing by and have a look! If you notice anything that's not working or is causing problems on your device, please leave a comment (and let us know what device you're using). Gabrielle will monitor this thread to make sure we fix things up!! Look what I found! 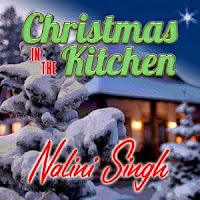 Tantor Audio recorded the short story "Christmas in the Kitchen" as a free audio download. Available internationally. :-)). Enjoy! If you'd rather read the story, you can find it here on the website. Kicking off the Friday Book Club a little early. What are you reading and loving this week? p.s. I'm reading through all the suggested quotes here and on Facebook to decide which ones will go on the mug and it's so hard to choose! We might have to have a Part I and a Part II lol! A reminder that this month's newsletter will go out in approximately fifteen hours, complete with a second full chapter of Shards of Hope. Subscribe link. Spotted by a reader online. 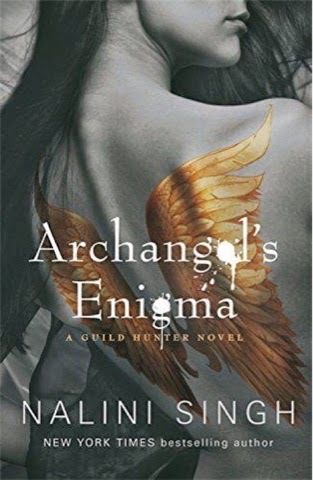 Striking international cover of ARCHANGEL'S ENIGMA!! It's book club time again! What are you reading and loving this week? Okay, I need your help. You all know I had some Guild Hunter mugs made up for giveaways. At this point, they've gone everywhere from the USA, to other parts of New Zealand, to South Africa! Anyway, I was thinking I should get some Psy-Changeling mugs made up too, to celebrate the release of SHARDS OF HOPE. This is where you come in. As you can see from this picture of the Guild Hunter mug, there are quotes all around it from the books. I want you to nominate your favorite Psy-Changeling quotes for the Psy-Changeling mug, to ensure we choose quotes you love. It works best if they're one or two lines long, as otherwise, it's harder to fit them in. So hit me with your favorite quotes!!! The AudioGals are celebrating the audio release of Rock Addiction with an in-depth interview with me, plus a giveaway and a first chapter listen of Rock Addiction. The narrator, Justine O'Keef, has a lovely voice. Please share: ROCK HARD has dropped to an incredible $2.18 on Kindle. This is an Amazon generated sale, so I have no idea how long it'll last, but if you want to grab the book, now's your chance! Hot rugby player turned CEO vs his (growling) mouse of a P.A.? Game on!